Guests should go to the sign in table when they arrive and make their own name tags. The hope is this will speed up check in. The 20-30 min awards presentation will start no later than 4:30 pm and end by 5 pm. The remaining hour will be for socializing, networking, and enjoying the artwork. 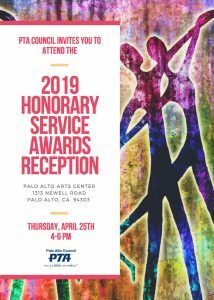 In addition, there will be 5 people and one group receiving special awards bestowed by the PTA Council. Only these honorees will have a minute or two to speak if they want to.